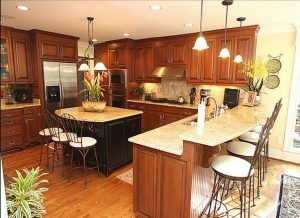 At Sorrell’s Cabinet Co., we offer a number of cabinetry services to personalize and enhance the appearance of your kitchen or other functional spaces. We serve those in Central North Carolina, providing design, build, and installation services to suit all of your needs. If you have any questions about the below services, be sure to get in touch with our team at Sorrell’s Cabinet Co. today. Our custom cabinets are incredible additions to any home. For an experience unlike any other, be sure to get in touch with Sorrell’s Cabinet Co. Our craftsmen are dedicated to bringing you custom pieces that suit your individual lifestyle, home, budget, and overall needs. The design services we offer provide you with completely unique cabinets that will outfit your kitchen or other areas of your home to your requirements. We work in close partnership with you to create cabinets that match the rest of the home. In addition to our custom design and builds, we offer comprehensive installation services to get those cabinets in place. Our team will ensure your new cabinets are installed properly to provide you with beautiful pieces that last for years to come.